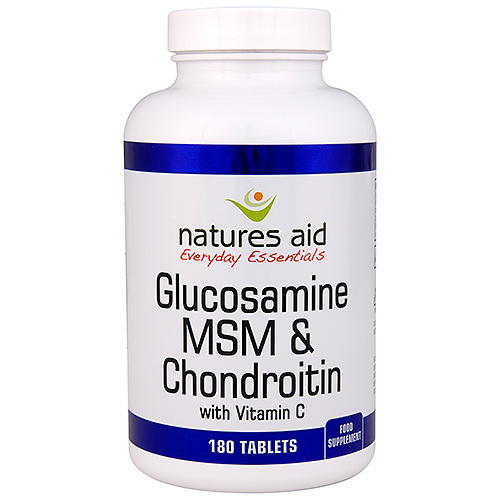 Natures Aid Glucosamine, MSM + Chondroitin provides 500mg of Glucosamine Sulphate 2KCl, 500mg of MSM and 100mg of Chondroitin. Glucosamine Sulphate 2KCl (product of crustaceans), Methyl Sulphonyl Methane, Microcrystalline Cellulose, Chondroitin Sulphate (product of fish), Vitamin C (as Calcium Ascorbate), Tablet Coating (hypromellose, Glycerine, Lecithin, Dextrose), Anticaking Agent (Vegetable Source Stearic Acid), hypromellosecellulose,Anticaking Agent (Silicon Dioxide). 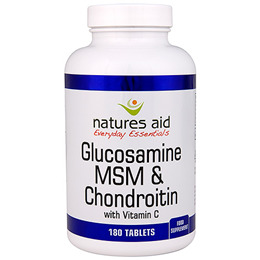 Below are reviews of Natures Aid Glucosamine, MSM + Chondroitin -180 Tablets by bodykind customers. If you have tried this product we'd love to hear what you think so please leave a review. Great price. Have not been taking this for long but I trust it will be very helpful in the long run as my knees are feeling better already.